The deal: Was there ever a more anticipated restaurant opening this year than Som Saa? No, no, there was not. After a stellar extended stint at Climpson's Arch last year, showcasing the best in regional Thai grilled food, chef Andy Oliver (along with fellow chef Mark Dobbie and general manager Tom George) put a shout out on a crowdfunding site: did anyone fancy going in on a permanent restaurant? Turns out half of London did, as they smashed their £550,000 target in just a few days. Now, we're in May 2016 and they've finally opened their doors - former textile warehouse doors, actually - in Spitalfields. 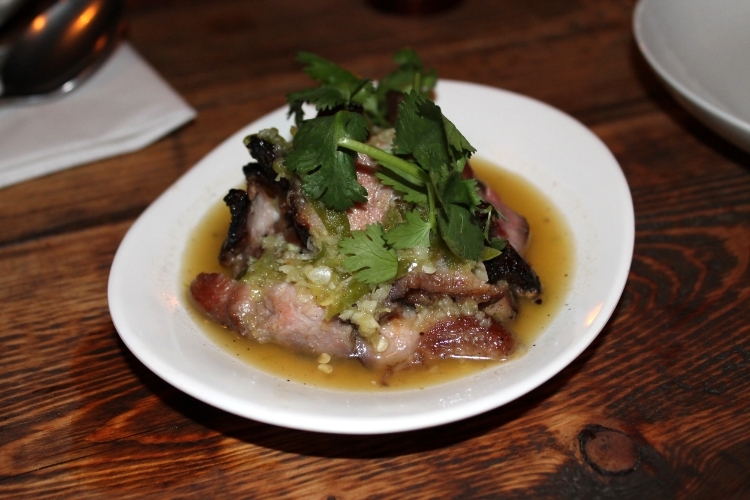 The bricks-and-mortar version of Som Saa is brilliant for two reasons. One, we can now enjoy the best bits of their pop-up with so many more dishes, and two, we can pre-book booths for groups, rather than spending half the weekend waiting in a queue. Essentially, double the reason to stop off for dinner. The food: On the night we visit, Tom excitedly tells us that their new venue means there's more room for new kitchenware; several woks and a proper traditional coconut press. This piece of machinery comes all the way from Thailand and allows them to use the freshest juice, cream and flesh from the fruit (nut? Drupe, apparently) across all of Som Saa's dishes and drinks - this is the level of finesse you're dealing with. From the off, the flavours are happily still as intense and fiery as their pop-up - the som tam (papaya salad, £8.5) still registers as the punch-you-in-the-mouth level on the Scoville scale, while their tasty fermented pork sausage (£2.75) paired with peanuts, cabbage and slivers of red chillies still makes the perfect pre-dinner snack. The dry red pork curry (pad prik king, £9.5) was a warming delight, with the bite of the green beans and a mellow tang of lime making it a serious contender for repeat visits. A new veggie dish, the stir-fry pad pak (£8) was a buttery-umami cascade of spring greens and oyster mushrooms, which sat well next to a heat-laden curry and a pouch of sticky rice. 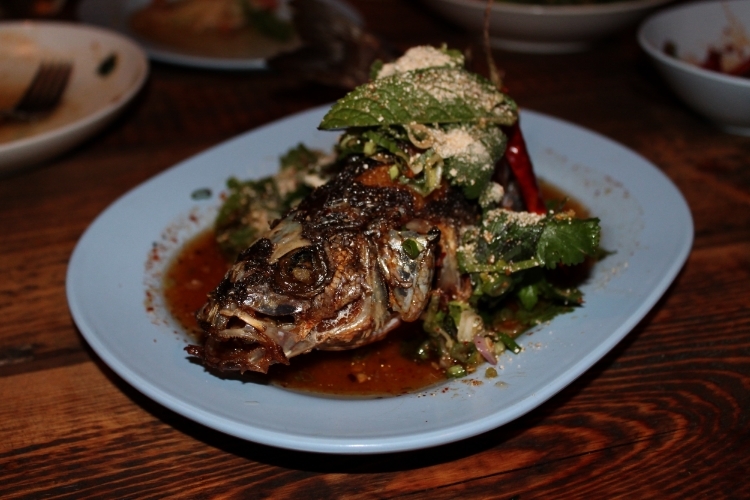 The grills were fired up again for a gloriously garlicky wodge of pork neck (mu yaang, £6.5), presented in its own juices and then it was time to stare down their signature beast: the whole, fried seabass (nahm dtok pla thort, £15), stuffed with Issan herbs. A dreamy dessert of palm sugar ice cream and caramelised banana confirmed what we already knew - this is the most masterful Thai cooking you're lucky to find south of the Mekong river. The signature dish: The eyes have it - the fried seabass. Damage to pocket: Pretty, pretty good. You know the deal, it's a few shared plates each, so dinner with drinks will work out about £40 a head. When to dine: Whenever you can avoid the queue, really. We'd recommend going just as they open on a Saturday (6pm) for an early dinner without the wait. Watch out for their new weekend lunch and brunch menu, coming soon.